I’m not talking about an organized group of queers raising awareness, organizing rallies, or staging events. While we do have political groups in the region that do good work for the gay community, sadly I’m referring to a different type of motion. Gay people from states like Kansas have a tendency to get the hell out of here as fast as they can. This mass exodus can often feel like the most significant movement that has taken place within the local LGBT community in recent years. Kansas has a long-identified “brain drain” problem. Young, talented people often choose to flee our cities for greater opportunities in larger, more urban areas on the coasts because they feel they can’t have the quality of life they desire in their home state. We have a parallel problem in the LGBT community. Call it a “gay-away”! From the minute young queers come out of the closet, most are itching to get away. They feel that Kansas isn’t a safe place where they can be themselves. They don’t believe that their love—and by extension who they are as people—will ever be accepted in towns with reputations for being a bit on the backward side. They don’t see a widespread, visible gay community they can safely fit into. They come to a simple conclusion—they’re not welcome in the middle of the country. So, when they graduate high school (if they couldn’t get away then, definitely when they’re out of college), they pack up their talent, take with them their dollars, and make a home somewhere that ISN’T over the rainbow. Within this reality, there are plenty of losers. The gay community gets smaller every time this occurs, diluting our political power and social influence. Gay individuals leave behind treasured memories and all of the people and places that made “the range” feel like home. Those they leave are left with empty voids .The cities and states themselves are perhaps the biggest losers, though. Every person who moves away from Kansas takes with them their potential involvement in the community, their probable contributions to local industries, and their definitive impact to the local economy. When it comes to having a strong state with bustling industries and a vibrant economy, does the sexual orientation of those participating really matter? The answer is obvious to me, but it’s up to us as a collective to really address that underlying issue. The LGBT community can mitigate this “gay-away” by refusing to feel that they have to leave their home to be themselves. The community at-large can be proactive in welcoming and embracing people from all walks of life. We don’t have to agree on every issue to be one, unified community. We can all be ourselves without threatening other people’s values. Let’s face it, life on either coast in the major cities is fast paced and pretty expensive! Here on the range, it’s much more affordable and relaxing. Sometimes the boldest thing you can do in life is to simply stand your ground. Each gay person who elects to stay in Kansas does just that. 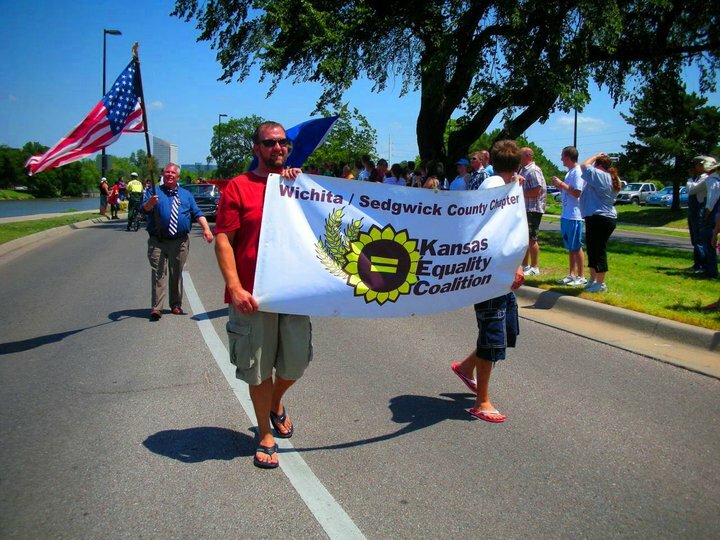 It’s time for a new gay “movement” in Kansas. Instead of moving away, let’s move this entire state forward together!